Happy Hounds Boarding School is unique. Unlike most board and train programs where your dog is forced to behave, we use our Breezy Method of teaching dogs to love to work for you. Your dog will be taught basic manners and self control by the owner of Happy Hounds, Pat Marshall, not by a junior trainer. With Pat's 25 + years of experience working with all breeds of dogs she can accomplish a lot in a short amount of time. The Breezy Method was developed many years ago while Pat worked with a very fear aggressive border collie, Breanna, that she adopted from a shelter. Breanna (Breezy) would lunge at people and dogs who scared her. Pat worked extensively with Breezy to teach her basic manners and ultimately, self control. Breezy was scared and Pat knew prong, choke, or shock collars only make dogs more fearful. Instead, Pat used only positive reinforcement methods to help Breezy gain confidence. Breezy learned to be a happy confident dog who enjoys life and is a wonderful member of the family. Through this experience, Pat learned the importance of teaching a dog to control their own actions, not for fear of punishment, but because good things happen when they do. This lesson has helped thousands of other dogs since then. The Breezy Method works for any dog, not just ones who are fearful. Your dog will be taught to sit, lie down, go to a bed, sit instead of jump up, wait at doors, walk on leash, come when called, stay and leave things alone when asked. They will also learn to look to you instead of just reacting to the world around them. Our board and train programs are a great head start for the busy family who wants a dog they can live with. Happy Hounds offers two types of board and train programs. 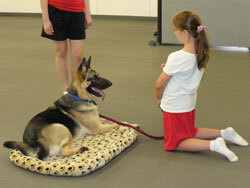 The Standard Board and Train Program is for adult dogs and puppies over four months. 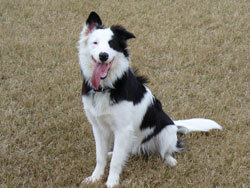 Your dog boards with us for two weeks to receive initial training. The Puppy Quick Start Program is for puppies 10 weeks to four months old. During this two week program, your puppy stays with us during the weekdays for training, and goes home each night with you. Follow up training is crucial. We'll get your dog started with a good foundation, but it's important that your dog learns to also work for you. You need to learn how to be consistent and set your dog up for success, so additional training is included in the price of both our board and train programs. This pup was four months old and this was taken about 10 days into his training. He came in with the usual puppy issues - jumping, chewing, biting everyone, not coming when called, not walking well on leash, etc. Please watch the focus and attention (and the little tail wagging throughout :). In this he worked for Pat and for her granddaughter who was nine years old. The puppy lived with little boys so it was important for him to learn to work with kids :). For availability and scheduling, call 281-550-7810 or send us an email. Our basic two week program is for puppies or adults that need good manners. Our goal is to help you have an easy dog to live with! This program is a great head start for the busy family who wants a dog they can live with, but who don't have time to teach good behaviors. It is also ideal for someone who is going out of town and would like to come home to a better behaved dog. For dogs with serious behavioral issues we do also offer three and four week programs, so please call to discuss what would work best for you and your dog. How it works: You leave your dog with us for two weeks and we train him for you. Your dog will be introduced to basic manners: sit, down, come when called, walking on leash, going to a bed, waiting at the door, leaving things alone and giving things up when told. We use only positive training methods that help your dog learn to love working. The program will also help with house training and crate training. He will learn to rest quietly in his crate and to go outside to do his "business." Follow-up training: We schedule a private lesson for the day that you pick up your dog so you can see what he's learned and start to understand how to work with your dog at home. The price of your program also includes your choice of either one additional private lesson or our six week basic training class, Just Say Please 1 so you have the tools you need to reinforce good behavior at home. You'll learn how to make good behavior a part of life so that you'll have the companion you want in the years ahead. 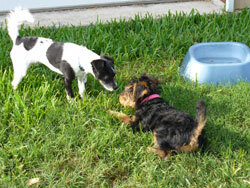 Do you have a new puppy in your house or an older pup that is a little too rambunctious? Is your puppy jumping all over you? Not coming when you call? Not house trained? Chewing up everything? New puppies come into our homes with no idea how we want them to act. They chew on everything, potty everywhere and can get into a lot of trouble. Isn't it is a good thing they are cute?! If this sounds familiar to you, our Puppy Quick Start Program can help! How it works: We developed this program at the request of new puppy owners who needed help getting started with training and socializing. The Puppy Quick Start is a two week board and train program where you drop your dog off in the morning (Monday - Friday) and pick him up each night. Your puppy will be introduced to basic manners: sit, down, come when called, walking on leash, going to a bed, waiting at the door, leaving things alone and giving things up when told. We use only positive training methods that help your pup learn to love working. The program will also help with house training and crate training. He will learn to rest quietly in his crate and to go outside to do his "business." You've probably been told to "socialize" your pup, but it's hard to do that safely. Puppies under 4 months of age have not had all their vaccinations, so it's not safe to take them to parks, dog parks or pet stores because there is no way to know if the other dogs in these places have been vaccinated. At Happy Hounds all puppies have had at least two sets of vaccinations including Bordetella and all older pups and dogs are completely vaccinated. Your puppy will get to safely socialize with other friendly dogs and puppies which will help with bite inhibition and help him grow up to be confident around other dogs. You'll take a tired puppy home with you at the end of the day and be able to reinforce his new behaviors in the evening and on the weekends so that the training transfers to your home and family. Follow-up training:The program includes our six week basic training class,Just Say Please 1 to help you learn how to work with your dog at home. You'll learn how to set your pup up for success and use management and structure while he is learning. With the tools you will be given you will know how to make good behavior a part of life so that you'll have the companion you want in the years ahead.